For a perfect springtime pick-me-up, we’ve got just the charm. 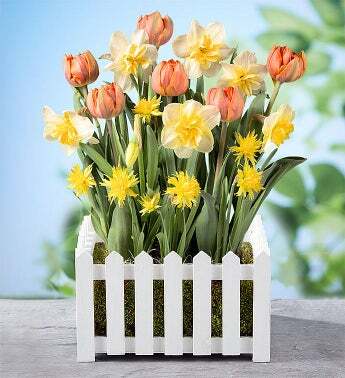 A cheerful mix of yellow and white daffodils paired with sweet coral-colored tulips, all nestled inside our white wood, picket fence-style planter. It’s a gift that’s sure to grow plenty of happiness.